Many CEOs and business leaders have heard about Infrastructure-as-a-Service and Software-as-a-Service through Microsoft Azure — but knowing what it all means? Understanding where and how you can use these tools to produce efficiencies, reduce costs, and position your company as a forward-thinking organization, is a challenge when you consider how unique your situation might be. Perhaps you have piles of legacy equipment, older mission-critical software that may not be compatible with newer technology, or you just don’t have the in-house IT expertise to rely on. Obtaining the right solution is an involved process that starts with grasping the possibilities and zeroing in on what fulfills your needs while improving the company and ends with — well, it doesn’t really end. You need to ensure your project delivers on ROI, but modern IT means also continuing to look around for the next opportunity — because the competition sure will. It means building your company around this idea of continual improvement. Luckily, the flexibility of IaaS and SaaS can make this less of a daunting task. 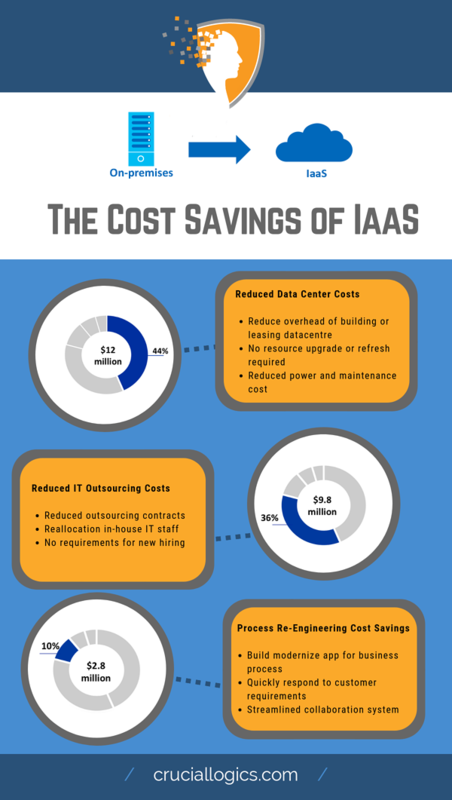 IaaS Versus SaaS: What’s the Difference? Some of your business needs can be enhanced with SaaS, while others will get powered up with IaaS. With these as-a-Service systems, you’re going to be operating through the cloud, and offloading a certain amount of work to it. IaaS allows you to get scalable access to storage, networking, and computing power. Rather than physically host a data centre, for example, you’re parking your stuff at someone else’s, and renting that power as you need it. SaaS means you’re getting access to software on a similar basis. Rather than host it all yourself, offline, you’re connecting to software — probably through a browser. If you use Outlook, you already use SaaS. What this all means is your IT team has access to amazing power and flexibility without being tied down to costly, cumbersome on-premises hardware. Many third-party vendors provide their SaaS products through Microsoft Azure. The service provides excellent security and efficiency to help them offer solid apps while assuring everyone that they’re getting the best, safest experience. There’s a lot to sift through — but there’s a lot to gain. Evaluating the possibilities of Microsoft Azure’s IaaS and SaaS capabilities is going to take some time. It may mean augmenting your current systems to run leaner — it could be just the right trigger for a total overhaul. But it’s going to mean a detailed plan, a challenging execution, and a necessary identification of metrics to measure against to demonstrate ROI. Looking for more detail on Microsoft Azure? If you’re interested in a productive, efficient Microsoft Azure journey, reach out to the experts. As Microsoft Gold Partners, CrucialLogics has Microsoft Azure deployments aplenty under our belt. We’ve got a keen sense for implementing the right IT solutions for effective business, and we operate transparently and conscientiously. Want to know more? Find out how to take the IT department beyond the cloud here.